The NPD Group's results for January are in with Dying Light securing the top of the software chart and hardware sales showing a fall of 23 percent after the Christmas hype. "January 2015 retail sales data across hardware, software and accessories decreased by 6 percent from January 2014, with growth in software (up $12.4 million) and Accessories (up $5.4 million) unable to offset hardware declines of $54 million," said The NPD Group's Liam Callahan. The newer consoles like Xbox One and PlayStation 4 saw sales fall by 22 percent while the older, "seventh generation" machines saw a decrease of 35 percent. "The combined hardware install base of PS4 and Xbox One is close to 60 percent higher than the cumulative hardware totals for Xbox 360 and PS3 at the same point in their lifecycles (after 15 months)." Dying Light hasn't just secured the number one in sales but also the honor of the highest month one sales for new IP in the Survival Horror genre, beating Bethesda's Evil Within. "Software spending rose 5 percent from January 2014 as eighth generation console spending outpaced seventh generation console software sales. Eighth generation software increased by 74 percent, seventh generation decreased by 36 percent and dedicated portable software sales dropped by 12 percent," said Callahan. "The sales of January 2015 launch titles were up over 200 percent versus January 2014, with Dying Light being the major new release of the month. If January 2015 releases performed in line with January 2014 releases, overall software sales would have decreased by 4 percent." In accessories there was a small 3 percent increase. Increases were seen across gamepads, interactive gaming toys, headsets/headphones, and power supplies compared to January 2014. Isn't that 23% fall a fall from January 2014 figures? 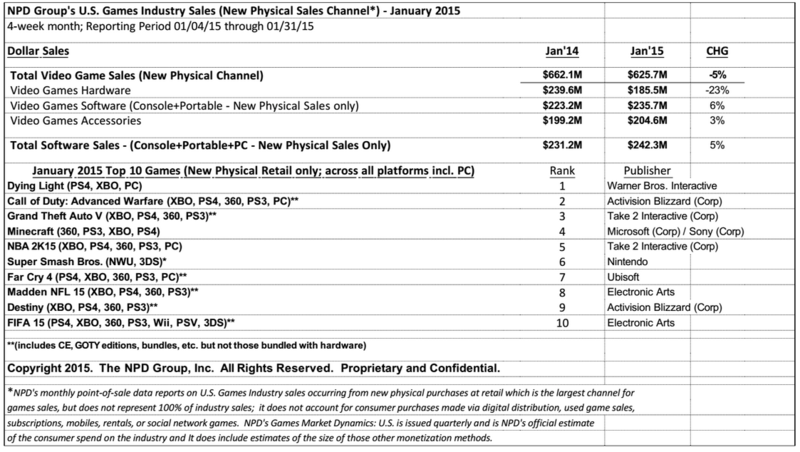 PS4 and Xbox One sold over 2 million units combined in December 2014; a 23% decline would put their January sales total in the region of 1.5 million units, and that just doesn't make any sense. Figures I'm seeing suggest both Wii U and Xbox One have increased by 10,000 units versus last January, PS4 has declined by 70,000 or more versus last January, and 3DS has also declined year over year by a fair amount. I'm seeing this being misreported around the web, I really think it needs to be cleared up. Yeah it even shows it in the NPD spreadsheet we included - it's year over year. We didn't say it's month over month.